Ibiza is known for a vibrant night life, beautiful beaches and gorgeous buildings, which is possibly why the Ibiza-based Ivan Torres Architects are so inspired. Their impressive home, true to Ibiza style, makes the absolute most of the environment around it without compromising on trend or grandeur. As Charlotte Tilbury once said, The light, colors, and energy of Ibiza are constant sources of inspirations for my work. I always leave Ibiza recharged and full of ideas for new shades, looks, and products. In today's homify ideabook, we will feel ourselves get recharged just by exploring this beautiful home! From this angle, the home looks like it is based in a barren desert, with a few sparse trees and sand surrounding the site. The architects have risen to the occasion, creating a home that complements the nature that it exists in flawlessly. 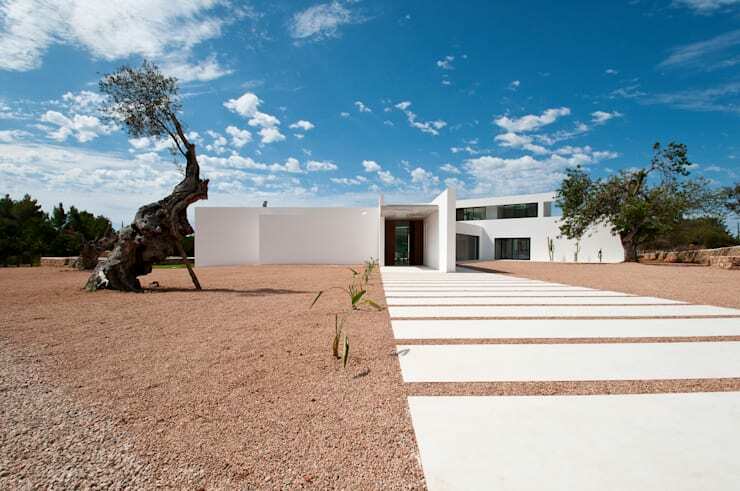 They've opted for a white building, which contrasts against the incredible blue skies and harsh landscape, creating a cool and peaceful look and feel. We can also see that the home is not modest in size, taking up a large portion of the land as well as going up a level. 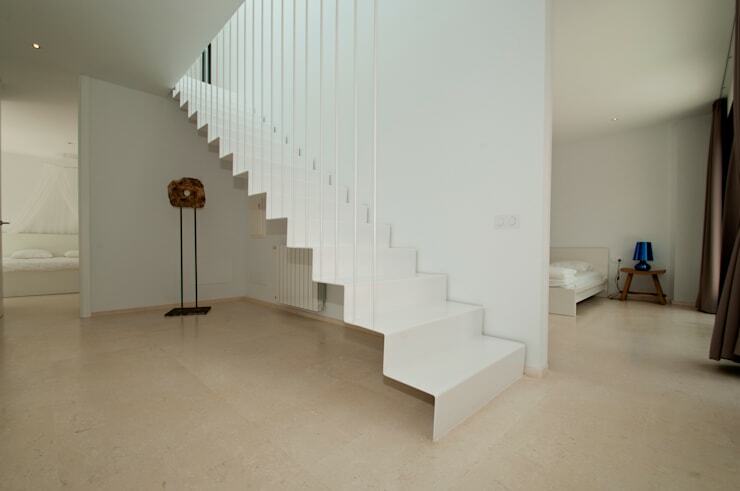 Our favourite part are the large, white stones that lead up to the front door. This creates a very vast feeling and ambiance. If you're a fan of white homes, you should have a look at: The American White House. If we go around to the other side of the home, we can see that it is far less modest and far more Ibiza style! A large, Olympic size swimming pool has been built into a very sleek white patio, providing enough space for family, friends and guests to enjoy the beautiful sunshine. White is always a great colour for a patio as it contrasts so wonderfully with the blue of the swimming, giving off a true island/beach look and feel. Just ensure that whatever material you go for when it comes to your patio, that you ensure that it is non-slip. With kids running around the swimming pool and family or friends taking a dip, you don't want anyone to slip. The designers have softened the stark white and blue look with soft, wicker deck chairs. These are perfect as they are durable as well as comfortable. Have a look through the homify pool products for inspiration for your own home! The patio of this home is very simple and yet sophisticated with weather-resistant white furniture and a little table for resting drinkings or snacks. This is the perfect spot to enjoy the shade if you need a break from the sun. Where possible, create a form of shelter for your patio so that you can enjoy it in all weather conditions. You'll also be able to add comfortable cushions or warm blankets to the outdoor furniture if it is sheltered, allowing you to snuggle up with your favourite book and a mug of hot chocolate outside, even in the middle of winter. When you have a home with such beautiful surrounds such as this one, you want to be able to utilise the views all year round. If we head inside the home we can see that the living room and dining room merges into one, thanks to the open plan nature of the space. 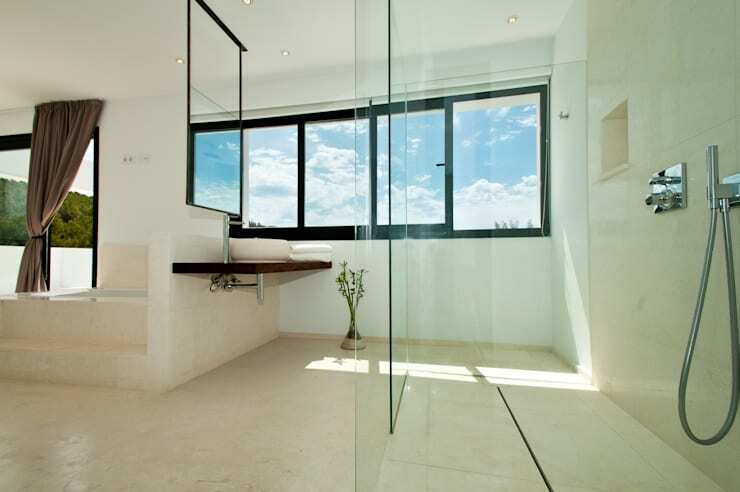 A large, glass door that slides open allows for a very transparent transition between the interior and the exterior. This is a great design tip! It allows for a much more spacious living area as well as for the patio and the interior living space to be utilised if need be. The designers have gone for a very simple and minimalist interior design, with white floors and very light, neutral furniture. They haven't crowded the space with unnecessary decor items or accessories. Lighting is also key in the living space, which is why we can see little lamps scattered around the space. This creates ambiance and romance throughout the interior. The staircase, while a functional feature of the home, is just as impressive and magnificent as the architecture itself. The staircase seems to float up to the second floor and is finished in the same sleek white that we've seen used throughout the home. Don't you love the chick and trendy white banisters, which look like rain cascading down from the second floor? This shows just how innovative and creative you can be with your stairs! The bedrooms are just as simple and effective as the rooms in the rest of the home! 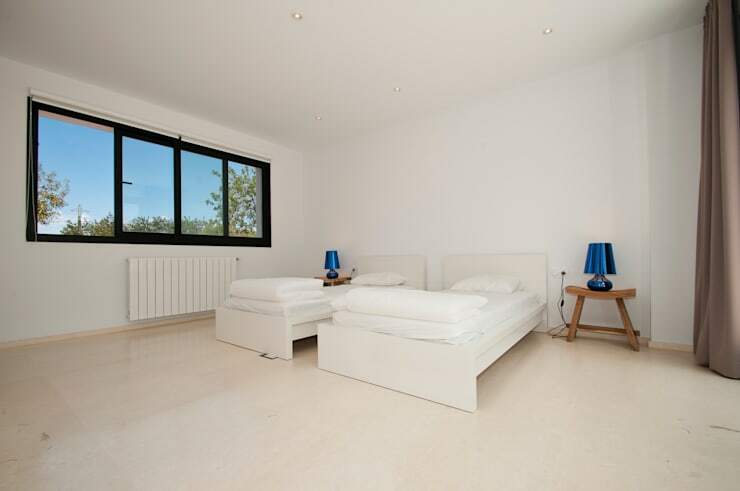 This bedroom features the same white floors and white walls that we've seen in both the interior and the exterior. The designers have included white bed bases and crisp, white linen. In fact, the only colour in the room are the wooden side tables and the bright blue lamps—magnificent! This very simple look enhances the spaciousness of the room, as well as the beautiful views that we can see beyond the window. If you like a little bit more personality and colour in your bedroom, have a look through the homify artwork for inspiration. We end off our tour in the bathroom, which some may argue is the most important room in the house. Considering you have to use this space every single day, it should be a peaceful haven where you can relax, unwind and escape from the rest of the world! The designers have not held back in this room, creating a spacious and modern room that features panoramic views of the entire surrounds. We love the large glass windows and doors, which allow sunshine to stream into this space. The rest of the look and feel is very simple—white, wood and glass. The shower is the best part of the room! It's spacious and chic and will no doubt leave you feeling refreshed and ready for the day. Look at installing one in your bathroom! Also look at this ideabook on: Soaking up these fancy bathroom ideas! What do you think of this beautiful home?